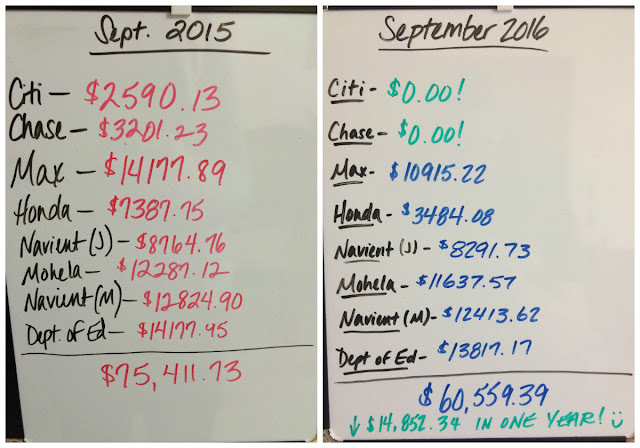 I can barely believe it, but as of this month, it's been exactly one year since my husband and I decided to start digging ourselves out of debt. Summer 2015. We were newlyweds. We'd just moved halfway across the United States, into our first real, shared home. We'd just bought real furniture for the first time (with credit cards, of course). We had real bills for the first time. So many exciting things were happening, and it was all costing us so much money. We were racking up loads of debt, and I didn't even have a job. That's when I started downloading free Dave Ramsey Show podcasts. I searched for his bestselling book, The Total Money Makeover, at the county library (because we were in such deep doo-doo, we didn't have the money to buy a copy), checked it out, and read it in about two days, soaking up every little nugget of advice Dave had to offer. In August, we followed that advice. We put $1000 in savings, created a budget, and began strictly following the cash envelope system. 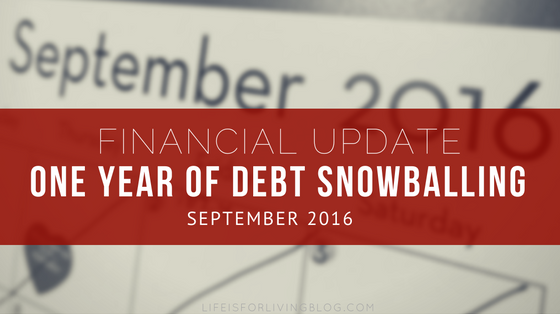 By September, I finally found a job and began bringing a second paycheck into our household, which allowed us to put Dave's famous debt snowball method into action. That's when we started attacking the credit card debt, and things really took off. In the last twelve months, we've sold a ton of our belongings to increase the cash flow to our debt repayment. We've had two garage sales. We've sold boxes of books, movies, and CDs to Hastings and bags of clothes to Plato's Closet. We've successfully sold jewelry, video games, tools, and other stuff on eBay, Craigslist, and our local Facebook Online Yard Sale group. We've chosen to eat oatmeal or rice and beans at home when we wanted to go out for steaks. I've worked double shifts and logged overtime. We've chosen to spend our days off lounging around at home rather than going out of town to spend money. I went ten months without buying a single article of clothing for myself (which is a pretty big deal for me, especially when it comes to Target clearance racks). It hasn't been fun. At all. In fact, it's been pretty flipping miserable at times. $14,852,34 of debt gone, in twelve months. Where could we be this time next year? WOW! You guys are such an inspiration! it is actually hard to be at default and then next thing you know collections will go pestering you all the time! That's totally insane! When the day comes that you are actually debt free here comes your dilemma about the credit reports. HAHA. But do you know that it can be erased? Yes, there are lawyers who can erase debts.